I believe I’ve mentioned this before, but I am a such floors gal. Okay I’m also a countertop gal, too, so let’s just say I like my surfaces to be crumb free and clean whether they are up or down. Clean floors make me happy, and our home is covered wall to wall with beautiful old ones that just so happen to get filthy throughout the week. I have learned to sort of let go of having them sparkle and shine most days because who has time or energy to do a daily mop? Not me. I do however tend to the areas we frequent most often (like our kitchen, entry, and living room) with a broom once a day to keep things semi-clean, and then mop up the leftover grime and goo every other week or so. Sometimes I’ll spot clean if we had a really messy supper, or sometimes I end up mopping twice a day because there have been many spills. And then there are some weeks that my broom and mop rarely see the light of day! In an ideal world, I’d deep sweep and mop all our hardwoods once a week on Fridays and let that be that, but I know better not to count my eggs before they hatch and rather just do our chores if and when I am able. Over the years I’ve received many questions on how we deal with our hardwoods when it comes to cleaning them. Our last home had hardwoods, and our home before that one did, and our home before that one too, so we are pretty familiar with how to care for them. Now that we have kids and are much more aware of what companies put in their cleaning agents, we’ve opted to walk more natural paths when it comes to making our home both clean and safe for our family. Floors harbor an incredible amount of pollutants and bacteria that we do not want our young ones (and pets) crawling and walking on, so we use the power of plants (essential oils) and soap to help us out. 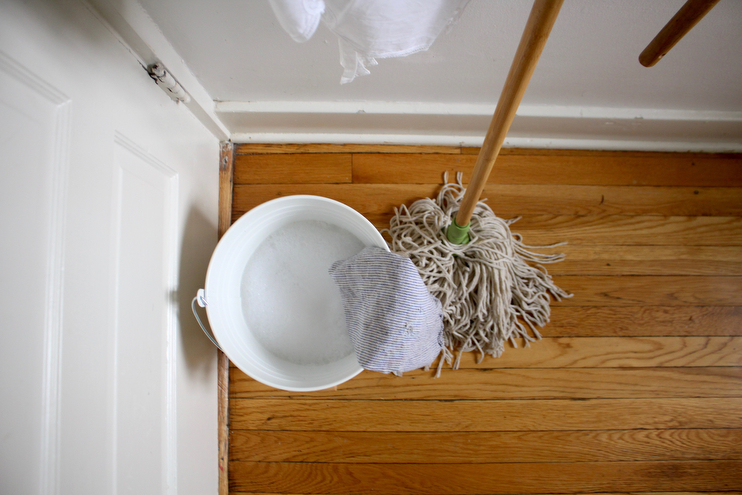 Below is a simple guide to cleaning your hardwood floors the natural way. I’ve also included the tools we use on the rugs in our home, which would work well if you have a home with carpet. Tools & Cleaning Products: You can find a cleaning tool inventory with source links here. 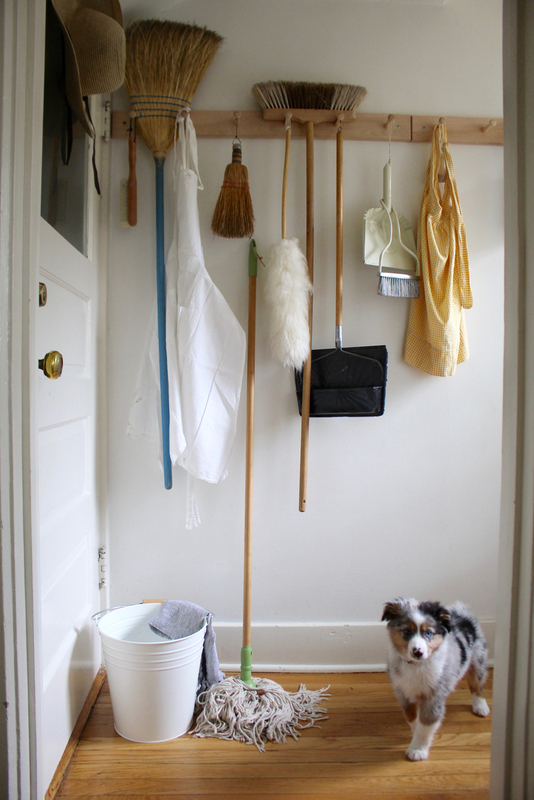 Large: Horsehair brooms pick up the tiniest specs of dust and is my go-to everyday cleaning tool for our floors. Small: A small dustpan for small messes is nice to have on hand. Large: We saved up for a Dyson years ago and cleans like no other vacuum we’ve used. Hand Held: This smaller version is great for cracks, crevasses, corners, and where the wall meets the floor and dirt likes to live. Rope Mop: Call me old-fashioned, but I love a good rope mop. They work so well! I love this one because it allows you to take off the top and toss it in the washing machine. Microfiber Mop: My mom uses one of these on her hardwoods and is happy with the results. I am considering purchasing one and perhaps letting go of our steam mop. If you go this route you’ll need a glass spray bottle as well. Steam Mop: Steam mops and hardwood floors are rather controversial. Some say they are harmful to them and take off the finish, while others love and use them despite that for their bacteria killing capabilities. We have one and use it once or twice a month for deep cleans. A simple enamel or metal bucket is the perfect container to house cleaning products, use for soapy water, and to tote things up and down the stairs. Dr. Bronner’s Castile Soap: You know my love for Castile soap runs deep and this is what we use on our floors. They come out streak-free every time and we don’t even need to use vinegar. Sal Suds: This is actually a cleaning concentrate and not a soap, but it works well too and does not leave a residue behind. It also has a pine scent that I really like. Always use warm water when cleaning floors if you can. It makes a world of a difference in the process. Eucalyptus, Lavender, Peppermint, Tea Tree, Lemongrass, Thyme, Clove, Rosemary, Cinnamon. I used to use citrus oils like Lemon and Orange, but now I don’t because they are not good for the finish. I also steer clear of vinegar for that reason as well. Cotton Rags – When cleaning your hardwood floors it’s important to make sure that you never leave standing water as that will damage the wood. When mopping I keep a few rags in my back pocket to wipe up water if needed. These are absorb water really well. First do a thorough sweep to get all the bits of dirt, dust, and debris off the floor and into the trash. Vacuum the carpets and shake the rugs. Hang them outside for awhile if you can to air them out. I like spraying Purification (YL essential oil blend) linen spray on these kinds of things to get rid of odors that woven fibers like to harbor. 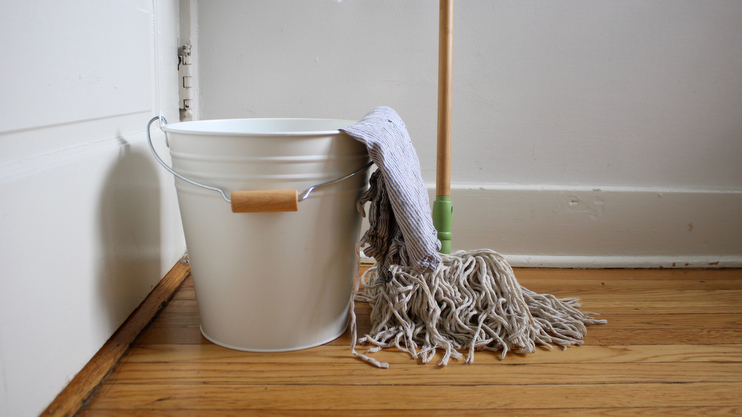 If using a rope mop, fill your bucket with the following in this order: 1 teaspoon Sal Suds or Castile soap + 10 drops anti-bacterial essential oil + 1 gallon warm water. If using a microfiber mop, fill your spray bottle with the following in this order: 2-3 drops Sal Suds or Castile Soap + 5 drops anti-bacterial essential oil + 2 cups warm water. If using a steam mop, put five drops of an anti-bacterial essential oil on the pad of the mop, fill tank with water, and mop away per usual. You may need to repeat the oil process a few times if you are mopping many rooms. Lastly, use rags and elbow grease to wipe up any excess water or smudges that are hard to mop way. Under our kitchen table or by the oven tend to be the places I have to do this most frequently. What’s your favorite thing to have clean? Are you a floors gal too? Hi, Amanda. If using Dr. Bronner’s peppermint castile soap, should you still also add the essential oils? Or is what’s in the soap enough?